University Putra Malaysia, UPM, was first established as the School of Agriculture in 1931. In 1997, the university officially changed its name to University Putra Malaysia. The university’s main campus is located in central Peninsular Malaysia, close to the capital city, Kuala Lumpur and next to Malaysia’s administrative capital city, Putrajaya. 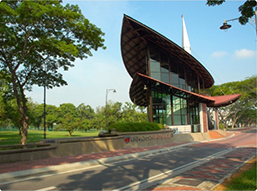 Currently, it is the most developed university in Malaysia and has the largest number of students and faculty among other national universities.， With the trend of globalization, Putra University continues to work toward becoming a university of international repute with around 200 partner schools in over 40 countries. Recently in July, PUTRA became the first business program in Malaysia to receive accreditation by AACSB, which is exclusive to business schools ranked within the top 5% in the world. National Chengchi University’s College of Commerce has become partner school with Putra Business School, setting up an exchange program for graduate students up to 5 reciprocal exchange quotas at both universities.